‘Arjun Singh is an accountant by day and a demigod by night, though he cares more about GST than about his own superpowers – and even lesser about life itself. Arjun is indestructible. It is a power he would gladly trade for some bananas and rum. But now some people know exactly what Arjun is capable of. They force him to work for their ‘unofficial’ army, assassinate terrorists and fall into life-and-death battles with a Chinese dragon. Worse still, they’ve not cleared his taxes. This is a novel from the Indian stand-up comic, Sorabh Pant. I enjoy his live shows – his ability to create jokes out of a wide range of topics from politics to everyday activities, etc. The very story of my getting this book was when I attended his live show in Chennai and post his show, he offered the book at a concessional rate, an autograph and a selfie, an offer which I didn’t want to turn down. 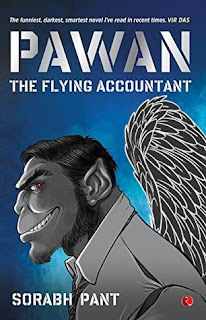 Coming to this very book, there was probably going to be more personal connect with this book considering the lead character of this book Arjun Singh and I are of the same profession, that is, a Chartered Accountant. I found the premise of the book extremely interesting and I got to reading this book immediately after buying it. This book starts off with a bunch of disclaimers and rightfully so, considering he touched some of the most sensitive topics in the country. However, the disclaimer also said ‘however, if you still choose to be offended by these jokes, just remember that the gods have a better sense of humour than you’. On that note, Arjun Singh, a reclusive Chartered Accountant working as an auditor in a firm with a lot of suicidal tendencies. His job is his only passion. He is invincible because he is from the same race as the Hindu god Hanuman; had superpowers but didn’t care about using them. He eventually comes in contact with India’s secret army who are meant to protect the country. It is revealed that Arjun is a Pawan, people from his race who emerge in every era to protect the country, starting from Hanuman to now, Arjun. The trouble faced by India was that China had its own covert plans to take over a town in the Indian state of Arunachal Pradesh and the secret army had to overcome the Chinese plan. There is no other book that I have read so far, which I felt had so many phases and my levels of enthusiasm varied in each of the phases. This book mocked some of the topics very well, such as politics, Indo-China relationship, the current exploits of top corporates in India, certain Indian stereotypes where it goes to the extent of hostages refusing to be rescued by a woman, etc. The author was also bold in places, wherein, there are certain perceptions about the country from a lot of Indians but would dare not say the same in public, the author astutely combined all of those and projected that as the speech of a Chinese diplomat in the book. The book had an interesting start, wherein there were cases where it was shown as to how the country was more obsessed with symbols than actual practice – such as Arjun befriending a gang called The Secular Gang with each member belonging to a different religion. Those were the phases that kept me going in the book. But at the same time, it needs to be said that the author was confused as to where he was taking the book. He tried to craft it the way in which he conducts his live shows – that is smartly connecting dissimilar topics and presenting a diverse show but that’s now how a book works. The fact as to whether Arjun was a Chartered Accountant or not made very little difference to the plot and the Goods and Services Tax (GST) related innuendos were so less that you could have very much ignored them. The book initially had a humorous feel to it, and then on, it had a bit of humour and seriousness but in the final third, it ended up being a lesson on philosophy, a serious story going on between the Indians and the Chinese, though, I do agree that he did have his one liners deftly placed throughout the book. Coming to character building, Arjun was one character where some effort was put into – hedonist, has strong views on countries and the very need for them, being rational in situations, etc. and as a reader, one could predict Arjun’s behaviour as the tale progressed. However, this was lacking in other characters of the book, including Kelly, a fellow member of the secret army; the lack of which made the romantic sub-plot somewhat drab. The author has put in a good amount of research into the situation at Arunachal. This is a book filled with highs and lows for me, and when it was in the latter phase, I wouldn’t even feel like resuming the book and when it was going good, I read 70-100 pages at a stretch. This book had the promise and could certainly have been better, but it is worth a read for those who are familiar his shows as they could connect with the type of humour better. For those who haven’t been exposed to his programmes, it could still be enjoyed if the person really is aware of what is happening in India at present and the situation surrounding it (for those who read subsequently, by at present, I mean 2017-18). On that note, I would award the book a rating of six on ten, I hope for a lot better books from the author in the forthcoming years.